Weather: fine and hot, no wind. Weather background: clear and hot for a few days. Lures: Lots! It was really quiet so I tried different lures in an attempt to find something that would turn the fish on. This morning was my first fish of the season after the winter shutdown, though after this morning I’m not sure if fish know it’s time to wake up. It was quiet to say the least. I fished from 6:30am to 11am and worked really hard for two small flathead and two whiting. It was a beautiful morning, we have had a couple of really warm days, supposedly a record hot spell for this time of year. It hit 370 today and it’s only the first week of October! I fished the southeast bank of Narrabeen Lake. Not a place I’ve fished much. The water was super clear which I never find as productive. I’m also finding the lake fishes better in the afternoon when the water is warmer. I could see plenty of bream that looked about 27cm but they just wouldn’t take a lure. I tried just about everything I had, different retrieves, lure and line. After a while I switched to the super silly gear, 0.9kg Sunline Super Fluorocarbon sniper fished straight through. This really is ridiculously light line but so much fun! I had plenty of follows but no takers. The Bream were very interested in the Ecogear SX40’s and the Atomic Hardz Crank 38 Deep Diver (Purple Shadow). I’ve had this Atomic lure for a while but this is the first time I’ve used it. It’s got an awesome action and I think this lure is going to get a workout this summer. The River2Sea bubble pop 35 (HC09) also had plenty of follows which is really fun when you can see fish eyeing off your popper but also supper frustrating when they won’t hit it. 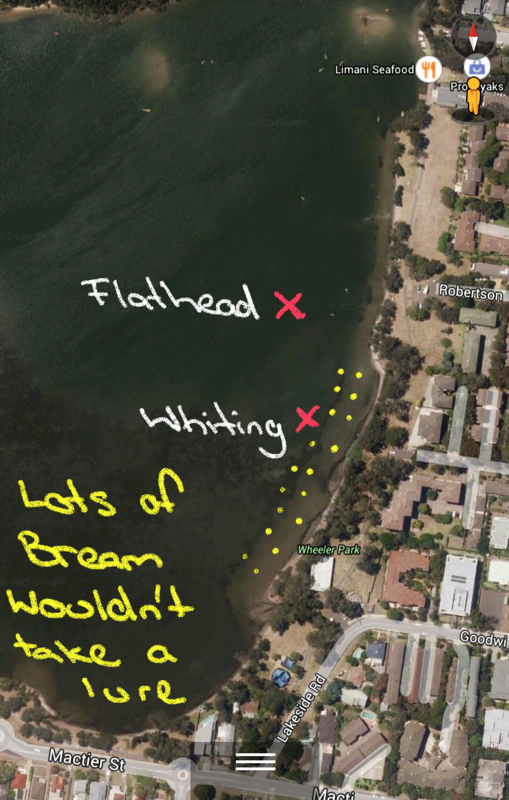 My two flathead came from the Fish Arrow Flash-J Huddle 2” Huddle Tail Green Pumpkin / Silver colour soft plastics bounced along the edge of weed beds. The Ecogear SX40F (306) accounted for the whiting which were a nice little bi-catch but not the bream I was after. All fish were successfully released. All-in-all it was absolutely beautiful morning and even though it wasn’t a great session it was still worth checking out this spot. I think it would probably fish better in a few months and late in the day, maybe after some rain when the water is darker.